Don’t forget adults without children – now with charts! My problem with this chart is that it focuses on parents. But this is problematic because (1) many adults aren’t parents, and (2) Medicaid is FAR stingier to non-parents. So I asked WaPo to make a similar chart for adults without children. Unfortunately, they don’t jump when I demand it, so they didn’t make the chart. At least not yet. You can click to enlarge. 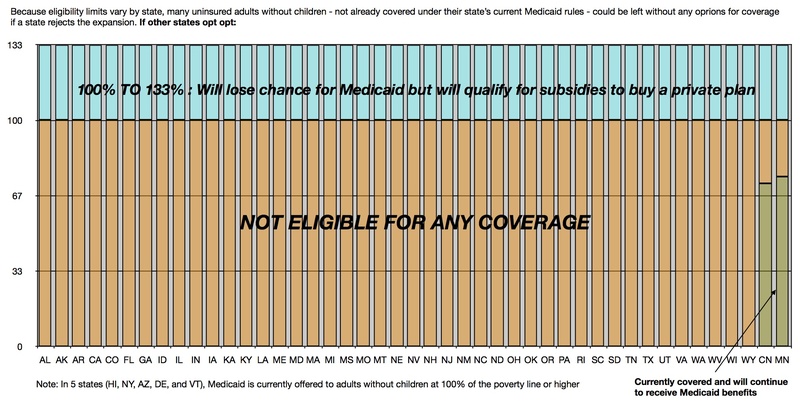 But the gist is that in only 5 states will all childless adults under the poverty line have benefits. In two more, they’ll have benefits only if they fall below 72% or 75% of the poverty line. 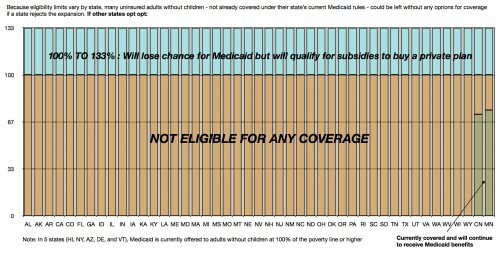 And in all the other states – all 43 of them – they will get no Medicaid at all, no matter how poor they are. Compare that to the first chart. This is much, much worse. These people will be totally without recourse if states opt out of the Medicaid expansion. It’s time we stopped ignoring this fact. 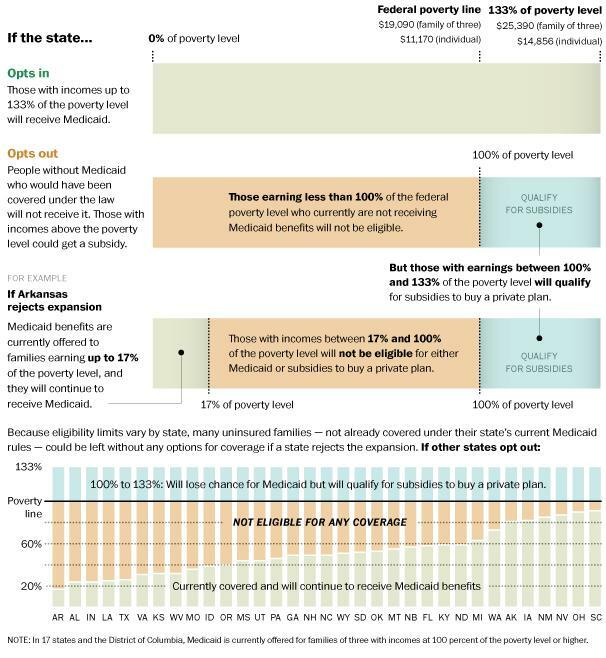 Traditional Medicaid is nowhere near the universal safety net many believe it to be. I hope I am not being a broken record here, but the states which do opt out of reform are the states which want to reduce their minority population. A number of sociologists and historians have noted that socialism has succeeded best in one-race, one-religion, homogenous societies as in Scandinavia. Social welfare legislation was enacted in France and Germany when they too were homogenous societies, except for small numbers of guest workers. cf Michael Lind on this issue. What multiracial, multireligious countries did they compare with? It would be interesting to see the % of “childless adults” by age in our population. Is it safe to assume that parents who do not have children listed as dependents on their tax forms are considered “childless”? For example, parents in their 50s and early 60s often have grown children who are filing independently – how does medicaid classify these parents? The probability of a chronic condition is highest in this group (among those under 65) – so medicaid coverage may be most useful to this group. So do these parents lose medicaid coverage when their children are grown and not filing taxes with them? I think they do lose coverage when their dependent children age out.